A fairy tale fantasy romance, Cinderella hits perfectly pure notes in retelling the story of one woman overcoming hate with kindness. Ella (Lily James) is simple rural girl brought up by kindly parents. Her mother dies when Ella is still a child, and on her death bed she pleads with Ella to always have courage and be kind. Her father (Ben Chaplin) remarries, but Ella's new Stepmother (Cate Blanchett) is an evil and selfish woman, while her two step sisters Drisella and Anastasia are conceited and rude. When Ella's father dies, her Stepmother reduces her to the status of a maid and the stepsisters nickname her Cinderella. Her only friends are a group of house mice, but still Ella does not lose her commitment to kindness. On a ride through the forest Ella has a brief encounter with the charming Prince (Richard Madden), and the two are immediately enchanted with each other. The Prince is about to succeed his ailing father the King (Derek Jacobi), and a grand ball is arranged for the Prince to choose a wife, with all the maidens in the land invited. Stepmother and the two stepsisters get themselves ready, but cruelly prevent Ella from attending the ball -- until Cinderella's Fairy Godmother (Helena Bonham Carter) intervenes. Directed by Kenneth Branagh, Disney's live action non-musical remake of the 1950 animated classic creates magic of its own. 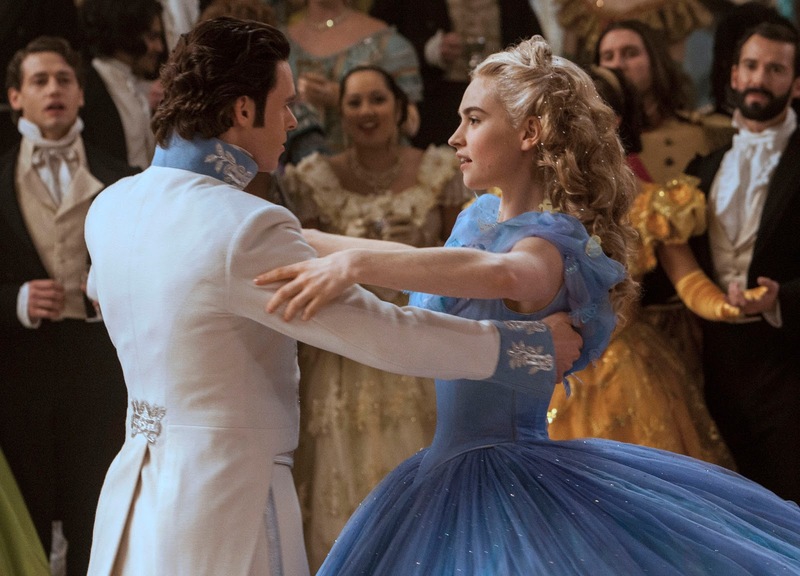 Targeting a family audience with a laser focus on story rather than sarcasm, irony, or gimmicks, Cinderella is a throwback to simpler times, and yet effortlessly succeeds in updating the message of tolerance and hope in the face of animosity and antagonism. Recognizing the inherent magic of the story, the film steers well clear of silly cutesiness. There are no talking animals and the few friendly mice and one mean cat are deployed in just the right amount. Otherwise Branagh allows the film to breathe deeply from the magical fantasy elements. A particular highlight is the centerpiece palace ball scene, starting with the Fairy Godmother's arrival all the way through to the carriage turning back into a pumpkin. The CGI is seamlessly woven into the action, with editing smooth enough for eyes young and old to appreciate the wizardry. It's not easy updating the character of a genuine Ella for a more modern audience, but the Chris Weitz screenplay focuses on virtues of tolerance and kindness reinforced with steely determination, and Lily James pulls off the role with glowing restraint. 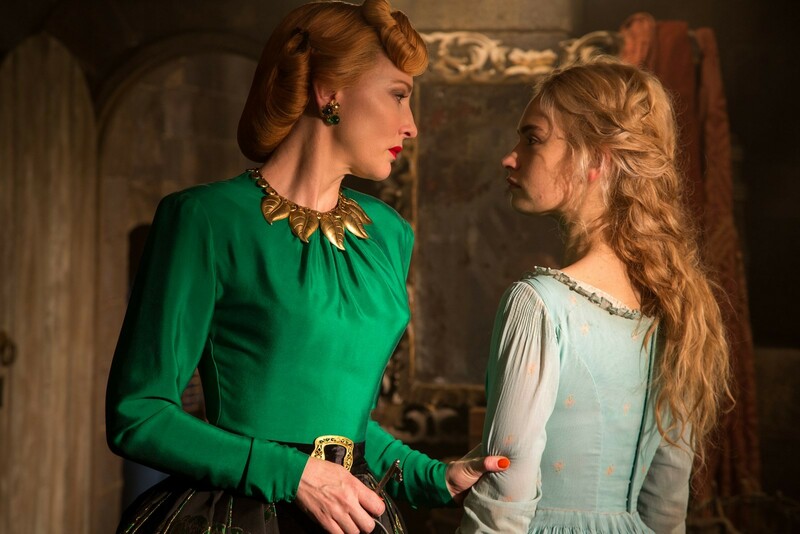 The Stepmother tests the limits of Cinderella's compassion, Cate Blanchett amplifying the character's hateful attributes while just hinting at a woman gone stone cold due to a stream of broken expectations. The film looks rich and magnificent, with colours often subdued around Ella to allow her to literally shine. The sets are grand and imposing, Branagh finding impressive perspectives to fill the screen with activity and detail. The story may be familiar, but with charm and ambition, this Cinderella earns her own place as an inspiration for young hearts and minds.